Dementia is a condition that, until recently, was spoken about relatively little beyond those involved in health and social care services. Today, rarely a day goes by without stories about dementia featuring in newspapers, on TV or on radio. Politically dementia is high on agendas worldwide. Recent years have seen an upsurge in publication of national dementia strategies and plans. In 2013 the first G8 dementia summit was held, where the major global industrial nations united to support action to increase dementia research and improve prevention, treatment and quality of life for people with dementia globally. Whilst there remains a stigma surrounding dementia in today’s society, there has also arguably never been a time when perceptions of dementia and the outlook for people living with the condition have been more positive. Dementia has truly ‘come of age’ in society today. 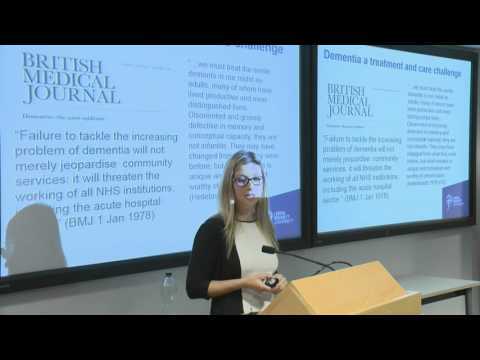 In this lecture Claire looks at dementia as a research and societal issue over the last 20 years and explores some of the drivers that have led to dementia’s coming of age. She considers, in particular, the role the person-centred care movement and applied dementia health and care services research have played in this rite of passage. Professor Surr has over 15 years’ experience conducting applied research, teaching and undertaking knowledge-transfer activities, with a focus on quality of care in care homes and workforce training and education programmes. She is currently leading a £2.4 million study funded by the National Institute for Health Research (NIHR) Health Technology Assessment Programme. The study is a randomised controlled trial involving 50 UK care homes exploring the effectiveness and value for money of Dementia Care Mapping, an observational technique designed to help care home support staff deliver enhanced person-centred care to people with dementia. In addition, a further study, which will shape the future of education and training around dementia, is also currently being led by Claire, alongside collaborators from the University of Bradford and the University of Leeds. It investigates the most effective approaches to training health and social care staff about dementia. The study - ‘What Works? Evaluation’ - is funded by the Department of Health’s Policy Research Programme on behalf of Health Education England and is due to be completed in July 2017. Surveys are being conducted to gather data on existing dementia training programmes, and their effect on staff knowledge and attitudes around dementia. The researchers will then conduct more detailed research in selected organisations to look at the ingredients that contribute to programmes that appear to be the most effective in leading to improved outcomes for people with dementia and their families. The results of the research study will help ensure that money is invested in the most effective training methods. They will be used to develop policy and commissioning guidelines for use by the Government, Health Education England and Local Education and Training Boards (LETBs), alongside good practice guidelines for health and social care organisations and education and training providers. Claire’s recently completed studies include evaluation of a cascade training programme in dementia for acute hospital staff and an evaluation of the impact of tuneable lighting on care home residents and staff.